Are WunderKeys lessons group lessons? The WunderKeys program is specifically designed to be offered as a one-on-one lesson. For many preschoolers this is their first experience in a non-group setting. This arrangement allows the instructor to personalize the lessons to each individual child’s needs as well as ensuring that your child is an active participant for the entire lesson duration. How long are they? How often? WunderKeys lessons are 30 minutes and take place once a week. There are 3 sessions, Book 1 is 9 weeks long, Books 2 & 3 are 10 weeks long. Do I need a piano at home? For the free trial, an instrument is not required. Afterwards, your child will need an instrument to practice on at home. This can be an acoustic piano, a digital piano or even a keyboard. My little one is really active – I’m not sure they can sit for 30 minutes. WunderKeys has been designed with preschoolers’ needs in mind. They will not be expected to sit patiently at the piano bench for 30 minutes! We incorporate five different activities into each lesson to ensure your child is always focused, engaged, and active – each activity is designed to reinforce concepts learned in their books. Our priority is to ensure that your child is enjoying every single minute of their lessons! What is the deal with the math? WunderKeys is primarily a program designed to teach beginning piano skills. However, it is a wellknown fact that music and math are closely related. As a bonus to this program, the WunderKeys books highlight this relationship and give your child a head-start on kindergarten math concepts and a positive first exposure to math. WunderKeys students learn sorting, ordering, counting, comparison, classification, and pattern recognition. When will they play songs? The developmental abilities of 3-5 year olds are very different than that of 6 year olds and older… for which most other piano programs are created. There are many different concepts that your preschooler will need to grasp before jumping into a “traditional” piano piece. 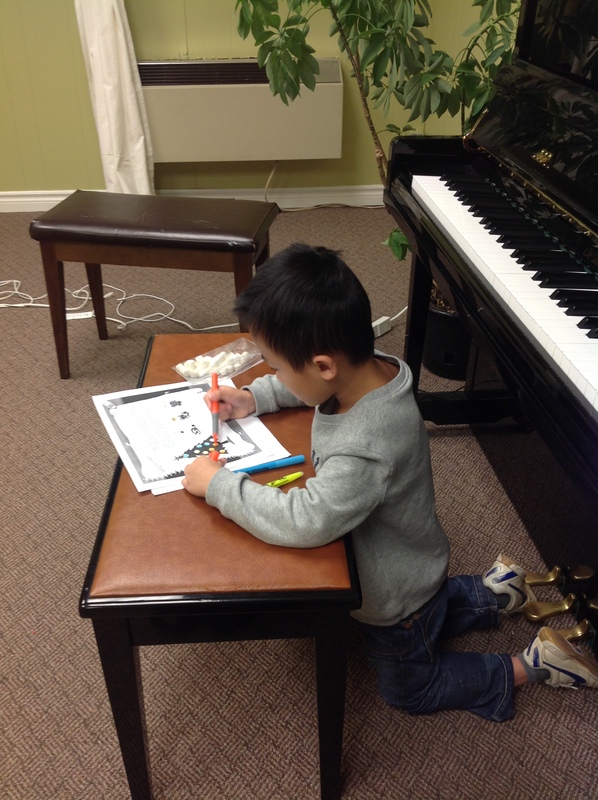 Therefore, our preschool piano lessons are spent exploring the piano in ways in which they are capable. All lessons are geared towards having them understand everything they will need to know before being able to read notated music. It is the perfect way to lead into a mainstream book series… and a life of musical enjoyment. WunderKeys Duets allow students to play “real pieces” along with their teacher, ensuring success and enjoyment. I have no musical background at all. How can I help my child at home? After each lesson in the book is a Home Activity Sheet that can be completed with your child during practice time at home. The books are designed to allow all parents to help with home practice, regardless of prior musical knowledge. At this age “practicing” should be approximately 10-15 minutes every day and is spent reinforcing what was learned in the lesson, and building finger strength and coordination. The intent is for home practice to provide you with some “bonding on the bench” time with your child, sharing in the fun of music. Do I need to purchase the books? There are three books in the WunderKeys series. The cost of the book and any other materials we use is included in the session fee. The books include both lesson activities and homework sheets. There are no other material fees involved.